Home > Coins for Sale > Why collect coins? Every coin tells a story and a nation's story tells its history. Although they are a tangible link to the past, coins are far more than currency. In a recent interview, Professor Sir Christopher Frayling, Rector of the Royal College of Art, described coins as "an art gallery in people's pockets". Although we use coins without a thought in our everyday lives, Sir Christopher is quite right. Coins can be viewed as, pictures in metal, a portrait gallery of rulers, or even as miniature sculptures. However, there is far more to coins than their historic context and as objets d'art. Coin collecting is perhaps one of the most multi-faceted pastimes of all. Coins are a door that opens upon a voyage of discovery into an array of diverse and unlikely subjects ranging from costumes to religion, from lettering to economics and engineering to metallurgy. Here are some of the stories they tell. Although the decimalisation of the UK's coinage was first mentioned in Parliament in 1816, it was not until the early Victorian era that the first step was taken. In 1847 Dr (later Sir) John Bowring, lawyer, traveller and a former Governor of Hong Kong introduced a motion to the House of Commons to decimalise the coinage. Everyone looked at the ten digits on their hands and saw the argument for its use and evidence of its practicability. Matters then moved relatively quickly. In 1849 a new silver coin was issued. A tenth of a pound, the new denomination was called a florin. It survives today as our 10-pence piece. Unfortunately the coin's debut did not go well as the abbreviation for Latin words for by the Grace of God and Defender of the Faith were omitted from the Queen's titles on the coin. The Victorian public did not appear to be bothered about pounds shillings and pence being replaced by another system, but they were outraged about the omission of the words by the Grace of God, Defender of the Faith. The coin was immediately dubbed the Godless Florin. An outbreak of cholera and subsequent deaths that year was even attributed to an outraged deity. Queen Victoria was also not amused and requested that the error was corrected. The next issue of the florin in 1851 bore the usual abbreviation DG FD (for the Latin Dei Gratia Fidei Defensor). However, the UK did not adopt decimalisation until 14 February 1971. 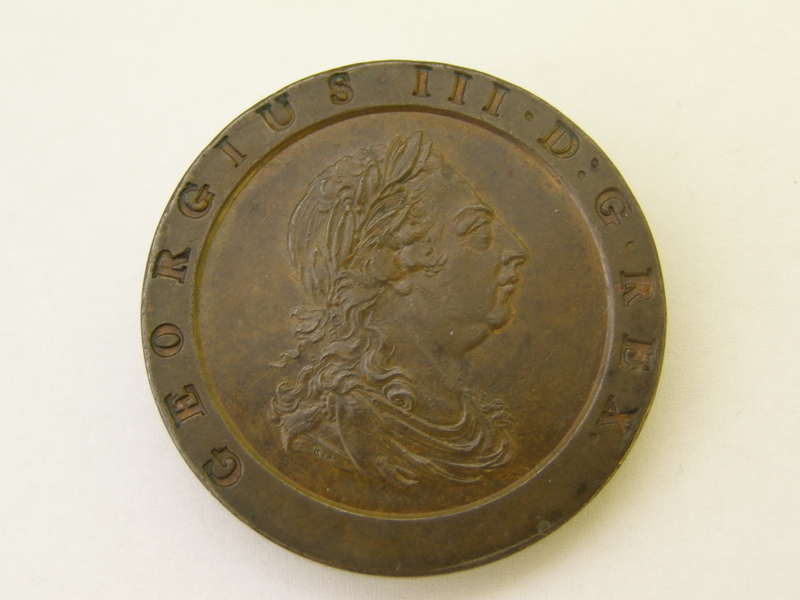 The reign of George III is more notable for the scarcity of coin as for the coins themselves. Nevertheless, when they were struck, the issues were generally remarkable for the abundance of coins placed into circulation. The shortage of small change resulted in traders issuing tokens that were used locally as currency and for unscrupulous individuals to counterfeit copper coins. The eighteenth century of course was the birth of the Industrial Revolution when Britain moved from an agricultural and handicraft to a manufacturing economy. As most of the lower value coins in circulation in the last decades of the 18th century were spurious, in time this could have jeopardised this great change. After all, who would move from the country to work in factories when the wages were paid with suspect money? One man's answer to the threat was to invent steam-powered machines that could mass-produce copper coinage that could not be counterfeited. The product of this vision was the result of collaboration between Matthew Boulton, the manufacturer and engineer who thought of using steam power to mint coins and James Watt, the inventor who adopted the steam engine to give a rotary action. By 1790 Boulton had eight steam-driven coining presses each capable of striking 50 large or 150 small coins a minute. Although he had been trying to persuade officials at the Royal Mint that minting coins by steam power was the way forward, he was not initially successful. However, in 1797 he received a contract to coin copper twopences and pennies at His Soho foundry at Handsworth, Birmingham. These are the first British regal coins to be minted by steam power. The pieces are remarkable for their size and excellent workmanship. In fact their technical specification was so high that they were almost impossible to counterfeit. The twopence weighs two ounces, making its Britain's heaviest and largest copper coin, whole the penny weighs one ounce. As they are so large, it is not surprising that they were soon nicknamed Cartwheels. Their issue soon ensured both trade tokens and the counterfeit copper coinage vanished from circulation. As the price of copper rose towards the end of the century, the Cartwheels themselves were withdrawn and replaced with lighter weight pennies, halfpennies and farthings. However, many were no doubt kept as keepsakes as they are relatively abundant in the market. Look carefully in the waves at Britannia's feet and you were see the word SOHO to indicate where the place of striking. The figure of Britannia is an integral feature of British coins. The personification of Britain by a female figure dates back to the Roman Emperors Hadrian (117-138 AD) and Antoninus Pius (138-161 AD), both of whom commemorated the achievements in Britain by striking coins featuring Britannia. She made her debut seated, resting her head on her right arm, while holding a spear in her left hand with her left arm resting on a shield and her right foot on a pile of rocks. For just over 1500 years, Britannia was lost to numismatics. However, she made her reappearance during the reign of Charles II, first on medals and then on the copper halfpennies and farthings. Although it is obvious that her re-emergence was based on her debut in Roman times, she had been given a makeover. Britain was now becoming a maritime power and Britannia was adopted as a symbol of the country's might on the high seas. The first medal that she appeared on was the Peace of Breda medal by Jan Roettier. Here she is featured with a sailing ship in the background. At my goldsmith's did observe the King's new meal, where, in little, there is Mrs (ie Mistress) Stewart's face as well-done as ever I saw anything in my whole life, I think: and a pretty thing it is, that he should choose her face to represent Britannia by. Frances Stewart arrived at Court in January 1662 aged 14 years as Maid of Honour to Charles II's Queen, Catherine of Braganza. She immediately captured the King's susceptible heart. He organised elaborate balls in her honour and even wrote a poem about his love for La Belle Stewart. While Mrs Stewart appreciated all the attention, she would not surrender herself to the King. Some of Charles's closest friends established a Committee for the Getting of Mistress Stewart for the King, but she rejected his advances for several years. It was not until after Frances married the Duke of Richmond in 1667 that she became the King's mistress. When Roettier engraved the dies for Charles II's copper coinage that that first appeared in 1672, he again used Frances's face for Britannia. As far as we know, this is the first occasion that a royal mistress has featured upon a regal coinage. The seated figure of Britannia has appeared on the coins of every reign ever since. However, on Edward VII's florins and some of the Britannia bullion coins of the present reign, she is featured standing. In the late 1880s, the barmaids of the nation's inns, taverns and public houses were facing a hazard that could cost them their livelihood. No, it was not a tipple of gin, but a new denomination coin - a double florin or four-shilling piece. Possibly introduced in the days when £1 = US$5 as an equivalent to the US dollar, or to compliment the florin as another step towards decimalisation, all it managed to do in the words of Sir Charles Oman, 'to beguile foreigners and simple folks, on whom it was foisted as a crown'. The coin was issued in 1887 in a short-lived series to commemorate Queen Victoria's Golden Jubilee. The design of this issue of coins was not popular and the public had a particular dislike to the double-florin. It became know as the Barmaid's Ruin, supposedly on the grounds that barmaid's were particularly prone to mistaking the denomination for its big brother, the crown and consequently faced dismissal for losing the publican money. However, there is no evidence that barmaids in particular were confused by the piece. No double florins were issued after 1890 and the Old Head Coinage replaced the much-criticised Jubilee Coinage in 1893.